Apply Now For An Instant decision With No Obligation & 97% Approval Rates. What Is A ‘No Credit Check Payday Loan’? Some lenders and brokers advertise ‘no credit check loans’, which may be attractive to you if you have a poor credit history or you don’t want your credit file to be affected by taking out a payday loan. However, all regulated lenders must carry out checks to ensure that you can afford to pay back the amount you borrow plus interest. Make sure you carefully read the terms and conditions of a loan before you make an application to find out how your credit file will be used. If a lender says that they will not run any credit checks, this is irresponsible as they can’t know if you can afford to repay the money you are borrowing. Taking out a loan like this may land you in serious financial trouble. 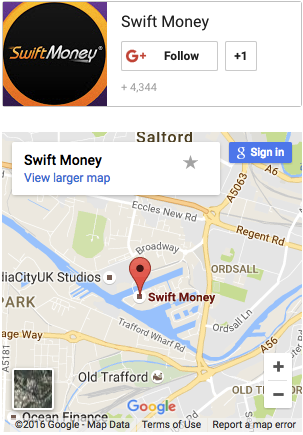 Here at Swift Money, we believe in giving people the help they need to stay afloat when money is tight. We do not believe in getting people into unmanageable debt. With this in mind, we carry out credit checks to find out if you are likely to be able to pay back the money you borrow before we approve your application. However, finding out if you qualify doesn’t take long. We can provide instant payday loan decisions through our quick online application process. Why do people look for ‘no credit check payday loans’? People may search for ‘no credit check payday loans’ if they have a bad credit history that may prevent them from being approved for a loan. They may also decide to look into this borrowing option if they have no credit history or they need money in a hurry and think that the credit check process will hold up their application. A credit rating is an assessment of the credit risk of a prospective debtor. Based on your previous borrowing record, payday lenders will use it to predict your ability to repay a debt. Your rating is important as it can affect whether or not you qualify for a mortgage, credit card or loan. For a fee of £2, you can check your credit score with a credit reference agency. Some agencies even offer free trials. A bad credit score does not automatically mean that you will not qualify for a payday loan. Our lenders take a number of factors into account before deciding if you can afford to repay your debts. Whether you have no history of borrowing or you’ve made serious financial mistakes in the past, you can always improve your credit score. In the short term, you should not apply for credit until your credit score has improved. You should also ensure that your details are on the electoral register as this can help you to get credit in future. It’s also a good idea to cancel any unused credit cards you have. In the longer term, make sure you pay off any debts you have on time and early if possible to show lenders that you can manage your money responsibly and repay debts without hassle. You should also avoid credit repair companies that claim to be able to fix your credit score for you for a fee. These companies often just do what you can do yourself and negotiate with companies that you are indebted to. Others act unscrupulously and may try to persuade you to lie to credit reference agencies or may claim to be able to do things that are in fact illegal. We have helped more than 1,000,000 people in the UK get through their emergency cash needs. Apply Now with Swift Money® today and let us help you too.